The chapter provides empirical evidence on the Italian case. Firstly, it highlights the main issues at stake during the 1980s, and presents the debate over the main ideas and arguments that were put forward in order to solve those issues. 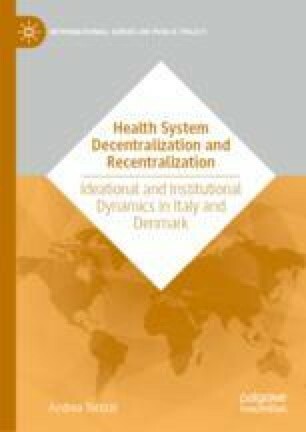 The chapter then describes the changes that occurred during the 1990s and provides an explanation of why and how ideas inspired by NPM and theories of fiscal federalism had a crucial role in changing the territorial organization of the NHS towards a more decentralized institutional arrangement. The chapter also describes the changes that occurred during the 2000s, explaining why and how measures of partial recentralization were introduced. Finally, the operation of the mechanism of ideational and institutional bricolage—which has brought about the endogenous and evolutionary changes of the NHS—is discussed.